Over the past several months, many folks have enquired as to why I haven’t been updating my blog, to which I have had no good answer other than to say I was busy with other “stuff”… So in response to their enquiries, while also attempting to start early on at least one of my New Year’s resolutions, I’ve promised myself to start posting again on a more regular basis. In the interim, my life and migratory cycles have remained relatively intact with summers being spent in Lake City, Colorado and the remainder of the time ensconced in Scottsdale, Arizona. I guess the term “Snowbird” is applicable, given that I/we follow the most desirable weather patterns with moderate spurts of travel elsewhere sprinkled here and there. That aside, the main change in my life during my lack of communication lies within my artwork, wherein opposed to the past, I have begun to show my work in a growing number of galleries. This started two years ago when I had my work placed in the Lake City Art Gallery and even though it was a small seasonal business it would still give me an insight on what artwork people gravitated to, commented on, where their eyes went. I also painted in the front window of the gallery to help promote my presence, which not only allowed me to work, it helped me monitor those visitor/patron actions and comments that I just mentioned. When I was placing my art into the gallery, the gallery owner who had operated the gallery for the past decade or so expressed his views as to what would sell, when it would sell (during the season) and at what would be the maximum pricing point. During his ownership he had represented just one artist, a noted watercolorist from Dallas, who like myself summered in Lake City. He also maintained a collection of art for sale, both originals and giclees, that he and his wife had purchased at various points throughout the years. The gallery is an avocation for both them, because like everyone else it seems, yes, they too are just summer residents. He treats the gallery rather casually, basically as a summer office for his “real” job selling medical equipment. Little to no advertising with the exception of small single panel “placeholders” just to keep the gallery somewhat visible. I had told him from the onset that I like to promote and advertise on my own dime, because the thought process of “build it and they will come” wasn’t something I subscribed to, I’d rather build it and advertise the hell out of it and then hopefully “they” might come. So initially I did some passive advertising by merely sitting and painting in the front window of the gallery, then I started running my own ads in the weekly newspaper, “The Silverworld”, highlighting finished pieces for sale, as well as those works in progress that were on the easel in the front window. During that first summer, the owner of the gallery asked me if I’d ever painted any Indian paintings ? I told him that years ago I had painted a few for Bill Harmsen and his Jolly Rancher Candy art collection. But I had done nothing like that recently. As mentioned the owner was/is somewhat mildly engaged at the gallery and will be gone for lengthy periods of time doing his “real” job, selling medical equipment. I had been in the gallery for three weeks when the owner announced that he would be gone for 10-12 days. After he left I mentioned to the Gallery Manager that I thought I would paint and Indian head study for the owner in his absence. As reference I selected an old image (circa 1880-90), it was a side view of a Souix Chief named “Afraid Of Eagles”, complete with war bonnet, beads, etc., etc. I knew couldn’t do a large piece because I wanted to have it done within the time the owner was going to be gone. So, I went with a piece that would have an image size of approximately 11” X 18” which had a lot of background to it…that should be “easy breezy.” As I had been doing, I was painting the in the front window of the gallery and I started the painting in the same fashion as I do with my wildlife subjects, by doing the eyes first. In just a few days I had nearly finished his face as was just starting to work within the head band of his war bonnet when a couple came in and watched me paint for quite some time. 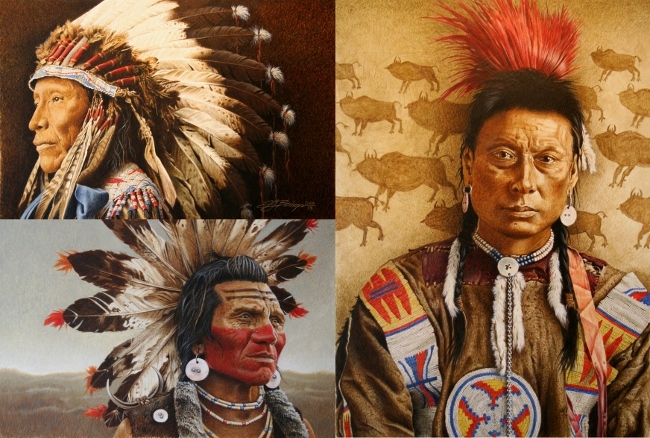 Later that afternoon a call came into the gallery from the couple and they wanted to buy the piece and asked what the price would be if they purchased it as it, with just the face done and a portion of the war bonnet…I said it would be the same price as it was finished, because it was already finished in my head. They purchased it that day. That summer during my first “Indian Period” I did a total of three painting all of which I was very fortunate enough to sell just like, “Afraid Of Eagles”… off of the easel. 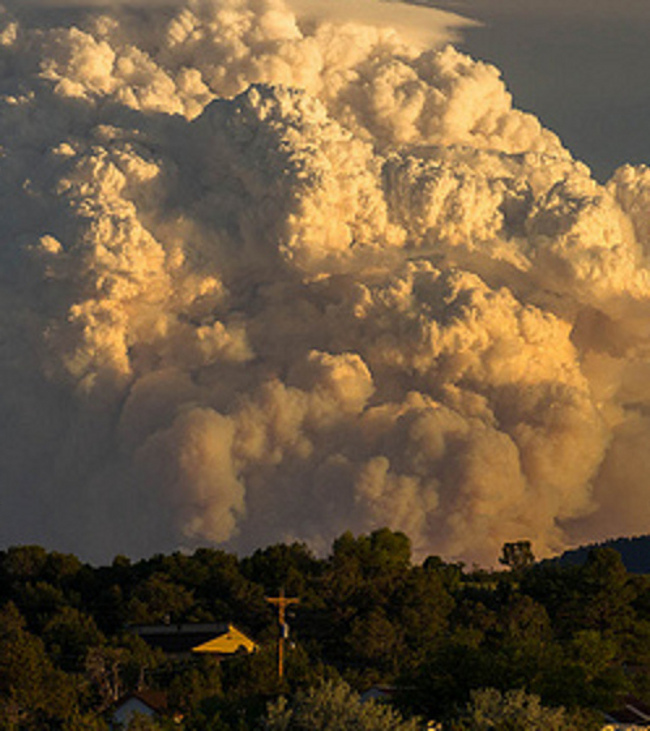 The summer of 2013 was also a year marked with ominous, looming forest fires, the largest of which was the “West Fork Complex Fire” that was located some 60 miles away (highway mileage) and some 40 miles away as the crow flies. The fire originally started near South Fork and worked its way towards Creede, the only other community (besides Lake City) situated on Colorado State Route 149 a mountainous two lane “highway” that runs between South Fork and the out skirts of Gunnison some 120 miles away. Initially everyone in Lake City, as with most everyone else, followed the progress of the West Fork Complex Fire on television and from time to time when the wind was blowing out of the SW the smoke that would waft through the valley. Then on one late Friday afternoon a cloud shape, resembling a thunderhead, appeared on the southern horizon above Lake San Cristobal. The only thing that was different about the particular cloud was that at the base it glowing orange and red. I was driving home to take a shower and then go meet some friends for cocktails at the “Cannibal Grill” that evening. In the time that it took for me to take that shower the thunderhead shaped cloud had risen into a column some 45 thousand feet. Roiling, turbulent, very reminiscent of images of Mount St. Helens when it erupted, this cloud was the result of the “Papoose Fire” a new fire that had leap frogged away from the main West Fork fire. As I drove into own I noticed that groups of people had formed along the streets and in the park all standing and staring at this aberration … and even though there are strict statutes against the public consumption of alcohol many of the onlookers were carrying adult beverages that they had brought with them from the “Restless Spirits, the Depot or The Cannibal Grill”…. As dire as that column of smoke appeared, when the local volunteer fire fighters, who were among those fighting the fires returned back from their shifts, they said that the forestry service folks had told them that there was “Zero” chance that the fire would reach Lake City. That wasn’t the case however for the steady stream of cars, carrying refugees, moving from south to north, coming from Creede and any ranches, farms and homesteads located to the south on Rte. 149 and surrounding lands who were evacuated and fleeing the spreading blaze. The fire lasted for nearly a month and amazingly, with a huge. diligent effort by thousands of fire fighters, the loss of property was minimal. Anyone who has visited, or knows anything about the high country knows that this type of event will become more and more commonplace due to the millions upon millions of acres of dead forest created by the “Pine Bark Beetle”. As you drive north from Pagosa Springs in SW Colorado you’ll go over Wolf Creek Pass, an entry point into the high elevations of the Rocky Mountains…at that point you’ll start to notice that the forests of large, mature pines blanketing the mountains have turned from their normal deep, verdant, emerald green, to a reddish gray-brown…dead, standing timber just awaiting a lightning strike or an errant human to provide the spark. As they say, it’s not a matter of if, it’s only a matter of when. Amazingly enough, in the 90 day summer season that marks nearly the entire business cycle (at least from a cash flow perspective) for businesses found in Lake City was relatively robust, fire, or no fire. The Lake City Art Gallery had visitors who signed the guest book with addresses from east coast to west coast, northern border to southern border, making for a steady metronome of visitors. The visitor demographics were broken into two groups with the earlier weeks of the summer, reflecting a younger group, parents with children, or hikers vacationing before school starts, with the mid, to latter weeks of the summer comprised of the older more established visitors. From the gallery standpoint, the economics reflected the demographics perfectly, smaller pieces seemingly sold earlier and the larger pieces followed later in the summer….also an old business rule, the 80/20 rule, or as it’s more appropriately known “Pareto’s Law of Optimal Mal-distribution” held true. It states that 20 percent of a grouping (whether it be clients, or employees) will do 80 percent of your business or sales. Not everyone who came into the gallery purchased art, on the other hand some that did purchase, purchased numbers of pieces. Invariably the larger pieces were always purchased on a second, or third, visit to the gallery…no impulse shopping. In almost every case of larger pieces being sold, those purchasers talked with me for lengthy periods. 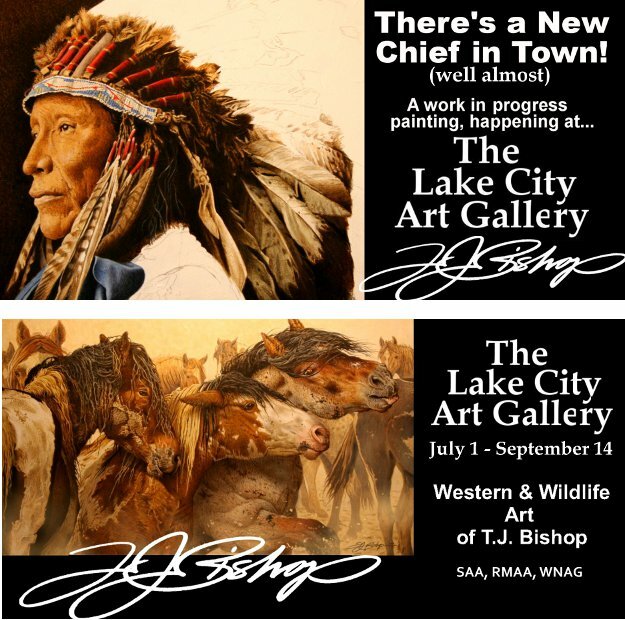 Even though my inclination is not to tie up my artwork in galleries, the successes that were realized in the Lake City Gallery over the past few summers gave me a modest change of heart. To that end, during the past summer we travelled to a number of communities in Colorado/New Mexico looking for potential gallery matches, with visits to Aspen, Telluride and Santa Fe. The vast majority of the gallery population(s) in those venues reflect more a more contemporary look rather than the type of realistic wildlife/western work that I tend to produce. Santa Fe actually gave me the best parallel with several galleries offering wide selections of western/wildlife artwork. Plus, Santa Fe hosts the “Indian Market” a week long event in August that brings in countless numbers of collectors and interested parties. 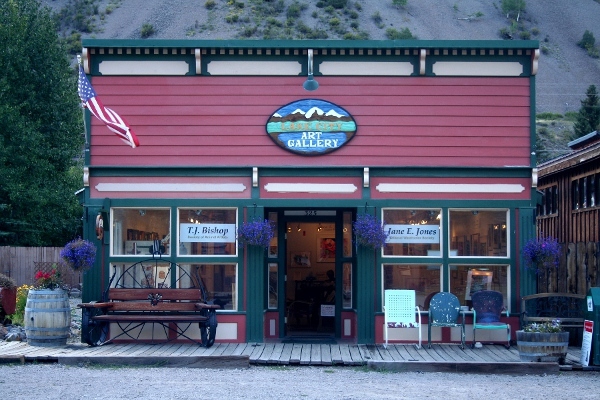 Two of the galleries that I favored, Huey’s Fine Art and Manitou, happened to be side by side, on Palace Avenue, just off of the Square in Old town. Ultimately I chose Huey’s Fine Art after having a lengthy conversation with the owner Keith Huey and noting that is stable of artists included John Seery Lester one of the true “Big Names” in the Society of Animal Artists and wild life art in general. We agreed upon a small offering of 4 pieces with the intent to expand upon grouping as I complete pieces that would fit that venue for a much larger cross section leading up to the Indian Market coming in the August of 2015. As with my involvement in Lake City, wherein I created my own advertising, I told Keith that I would be placing advertisements in various publications, the first of which was a well recognized Santa Fe Art Guide that is found in very hotel/motel room, entitled: “The Collectors Guide” I opted to placed a ½ page vertical Ad showing a section of my painting “Cheyenne Chic”, which even though it isn’t hanging in the gallery, it allows me to show another facet of my work and also supports the thought of additional exposure and name recognition.